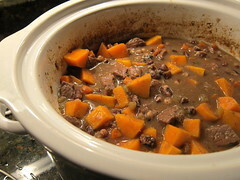 I had every intention of this meal being a basic beef stew cooked in a crock pot but then I started having ideas of adding sweet potato & beans and it turned a stew with a Southwestern flair. The seasonings we put in really added that Southwestern flavor. 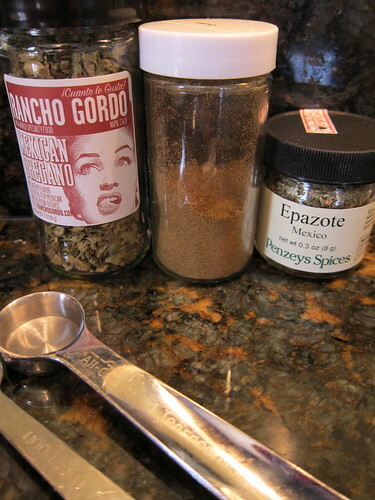 This was the first time we've ever used epazote & I can tell you it won't be the last. I had never heard of epazote until Matt wanted to buy it at Penzeys this weekend. According to wikipedia it's "traditionally used with black beans for flavor and its carminative properties, it is also sometimes used to flavor other traditional Mexican dishes as well." It has a wonderful smell especially when mixed together with the Mexican oregano. We were really happy with the way this dish turned out. The flavors all blended together so well and create a wonderful gravy without using any stock at all. The beans have a lot to do with that gravy, we used Vaquero beans from Rancho Gordo which have a slightly lighter flavor than black beans (though I think black beans would be a fine substitute). The real key piece in this stew though is the lime juice. That little bit of acidic citrus really makes the sweetness in the sweet potato shine. All & all a perfect meal on another cold winter night & a nice change from a traditional stew. Heat the oil in a large skillet over medium-high heat. 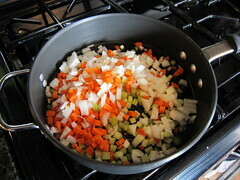 Add the onions, carrots, celery & jalapeno. Cook until the onions are translucent. 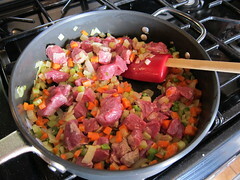 Add the beef & cook until browned on all sides. Sprinkle the flour over the meat & vegetables. Cook while stirring for 1 minute. Put the meat & vegetables in a crock pot. Add the beans, water, epazote, oregano & cumin powder. Cook on high for 4 hours or until the beans are tender. Add the sweet potato. 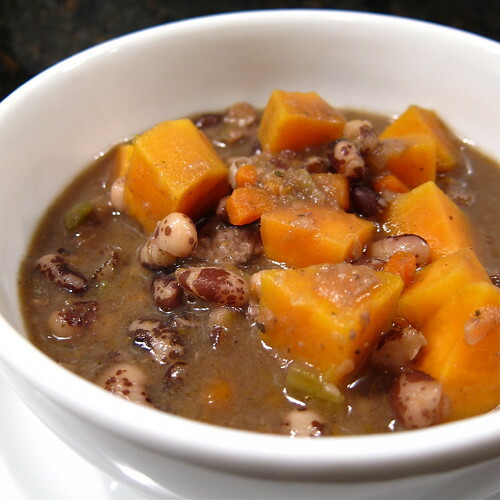 Reduce the heat to low & let cook another 1 1/2 - 2 hours until the sweet potato is tender. Stir in the lime juice. Taste and add salt if needed. I did this in a crock pot but you could also easily simmer it on the stove instead. This stew would probably be good served over some rice though it doesn't need it. I need to stock up on my spices again. I used to have a great array, and loved to collect some of the odd ones. So yeah, I love this stew indeed. An excellent example of cooking as a journey! I've heard of epazote but haven't tried it yet. However, my husband LOVES black beans and it sounds as if this spice is absolutely essential. Will plan a trip to Penzey's (or maybe Mercado Central) to pick some up this weekend. Love the stew! I need to get some epazote, too. Always wanted to try it. And I have to say, those are the prettiest beans! 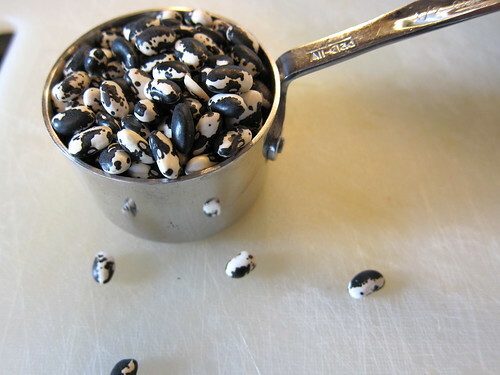 i wondered what kind of beans those were--they look nifty! also, how is it that i, a major, MAJOR fan of black beans, have never heard of epazote? it's wrong, i tell you--i'll have to hunt it down! Oh wow, I've not heard of that spice either. Great move with the sweet taters. This will be a good way to use my crockpot. Trying it for sure. Kat, this dish warms me just looking at it. The beans make it really filling. Did you know that epazote and stink weed are one in the same. You should check it out on wikipedia. Cracked me up. I bought mine from Penzeys too. This is so good! Thank you for sharing!